Emo National School is a primary Catholic school situated 6 miles to the northeast of Portlaoise. Children between the ages of 4 and 12 years attend this school. 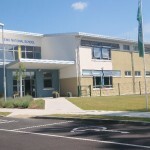 Originally built in 1889, the children moved into their new school on the 15th June 2009. Altogether, there is a staff of 12 full time teachers and one part-time teacher who are assigned to duties as follows. Our team also includes four full-time S.N.A.’s ,a secretary , cleaner and part-time caretaker . Emo National School is a rural co-educational Catholic school under the patronage of the Catholic Bishop of Kildare and Leighlin that aims at promoting the full and harmonious development of all aspects of the person of each pupil: intellectual, physical, cultural, moral and spiritual including a loving relationship with God and with other people. Prayer is a feature of the school day. This school provides religious education for the pupils in accordance with the doctrines, practices and traditions of the Catholic Church and promotes the formation of pupils in the Catholic Faith. The school works in co-operation with the local priests and parish in all matters and will, as part of this co-operation, together with parents engage in the preparation of the pupils for the sacraments. In Emo NS we strive to enable children to reach their potential .We recognise the role of teachers, ancillary staff , parents, and clergy as partners in this process, all aiming to achieve what is best for each individual child/pupil. The school’s Code of Behaviour reflects the Christian values of forgiveness, reconciliation, new beginnings and hope .While the school acknowledges the importance of academic excellence it strives to contribute to all aspects of each pupil’s development – spiritual, emotional, social, cultural, creative and moral. The school seeks to maintain the highest professional standards where staff development and planning are always to the fore. Emo National School recognises that all children are equal in the sight of God. We will have special regard for the less privileged in our school community. The school will also be aware of the needs of specific groups within the school such as children with Special Educational Needs, New Irish Pupils (Immigrants) and Ethnic Minorities. Emo National School acknowledges that each of its students is uniquely gifted and we seek to provide each one of them with curricular and extra-curricular opportunities that are suited to his/her aptitudes and aspirations.